Please join us on July 28th for Dinner on the Creek, a nine course exploration of deeply local and deeply artistic cuisine presented by culinary alchemist Adam Burke at the Clear Creek Schoolhouse and Community Theater. Classically trained at the Culinary Institute of America at Greystone and with Michelin Star kitchen experience, Adam will be practicing his craft and offering a farm to fork dinner in an intimate setting using exclusively local ingredients. Here on Clear Creek, we talk about eating in a way that's "radically local," and what we mean is that every ingredient is rooted (which is the origin of the word "radical") in this same land we inhabit. In some circles, the phrase "local food" is used to include anything for hundreds of miles around, but we're drawing things much closer to home. Most ingredients come directly from our gardens where the dinner will be held, while others, such as the pasture-raised meat and honey, come from close friends and Berea Farmers Market members. And some ingredients we forage from the wilds of these Appalachian Foothills. Each bite holds a story that roots our guests in place. As the evening unfolds, guests will enjoy a multitude of courses, each introduced in such a way as to reveal those stories of connection. As we draw nearer to the date of the event, and we know with greater clarity which seasonal delights the land will be offering up at that time, please watch the Berea Farmers Market website for the working menu to appear! The meal will take place on the beautiful Clear Creek Schoolhouse and Community Theater grounds just seven miles from Berea. Weather permitting, the meal will be served in the open air, nestled in the lawns between the historic farmhouse and the edge of the gardens and orchards. In the case of inclement weather, dinner will be served in the restored centenarian schoolhouse where we host a diversity of cultural events. Live acoustic music will be woven throughout the evening--we hope to delight all of your senses! 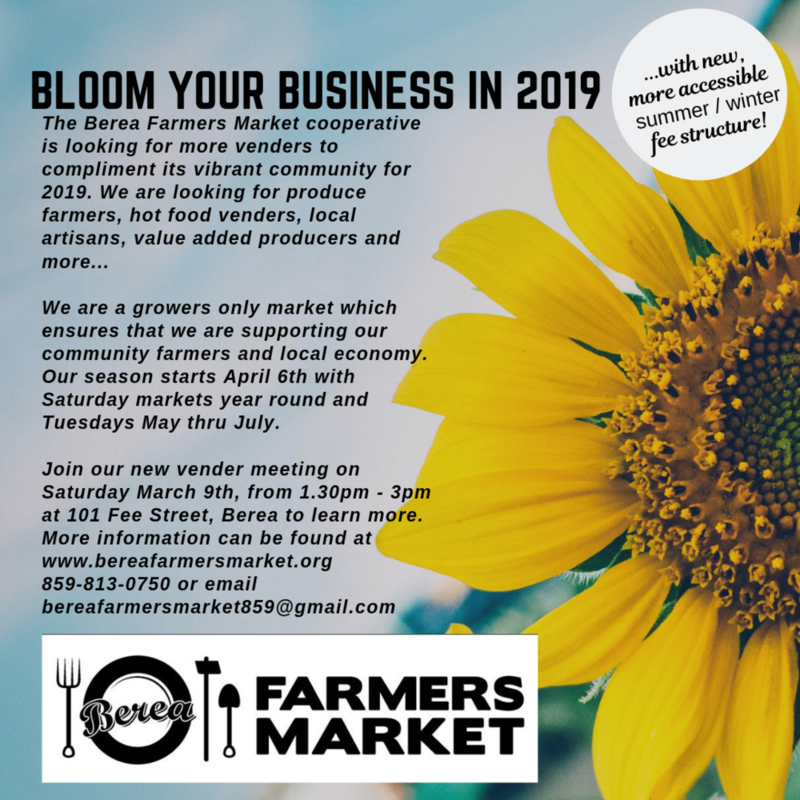 Tickets are available at www.bereafarmersmarket.org, or in person at the Berea Farmers Market (416 Chestnut St in Berea) on Tuesdays from 4-7 and Saturdays from 9-1. When reserving your ticket, please let us know whether you'd prefer the omnivorous or vegetarian alternatives. We ask for a minimum donation of $75 per person, with the option of wine pairings for $85, with proceeds benefiting the Berea Farmers Market. Consider arriving around 5:00 to explore the gardens and grounds; a guided tour will begin at 5:20, with dinner being served at 6:00. This is a full evening, slow food experience, with ample opportunity to linger over the flavors, so please anticipate being with us for several hours. We recommend purchasing your ticket early, as this is an intimate event limited to 20 guests. We're also able to accommodate one lucky guest (or pair) with overnight lodgings in our airbnb suite--please visit https://www.airbnb.com/rooms/21066086?s=51 to learn more. We're excited for you to join us in this chance to remember that (as author and food activist Michael Pollan says) eating is an ecological act--and that far from being a limitation, bringing our food choices closer to home can be an exquisite sensory experience that grounds us in place and community! We're also deeply grateful for your support of the Berea Farmers Market, which plays such a pivotal role in our local food culture. To view photos of last year's Berea Farmers Market Dinner on the Creek, please visit http://tinyurl.com/augustdinneronthecreek. If you have any questions, feel free to contact us at dinneronthecreek@gmail.com, and thank you again for being passionate about local food and for supporting the Berea Farmers Market!